HOUSTON, TX (September 27, 2018) John Lin, a senior at Clements High School, has truly achieved test taking greatness, accomplishing the next to impossible by earning a perfect score of 36 on the February 2018 ACT exam. This score jettisons John into the top 1% of test takers on the planet. This is rarified air for any high school student, and one of the most academically prestigious accomplishments to which a student may aspire. 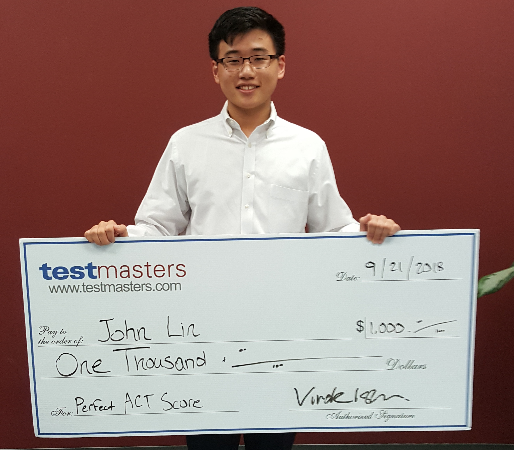 John’s perfect ACT score also secures his legacy and place in history among a historically significant number of TestMasters graduates to achieve such test taking greatness. But John is not just a test taking prodigy. He is also the president of the Academic Speech Team, and the Senior Class President at Clements. In competition, he has reached the state semifinals in speech and debate, and his service as a student council officer has allowed him to help organize major projects on the class, school, and district levels. He also volunteers at the DeBakey Veteran Affairs Medical Center. Although John is uncertain what university he will attend in the fall next year, he does professionally aspire to be a medical doctor and researcher. He expects to major in Biology as an undergraduate before advancing to medical school as a graduate student. In recognition of John’s achievement, TestMasters will award him a $1000 Perfect Score Scholarship. TestMasters, founded in 1991, provides effective yet engaging test preparation for major admissions exams and certifications. Its courses cover the SAT, GMAT, GRE, LSAT, ISEE, HSPT, ACT, PE and EIT. TestMasters students return consistently high scores on standardized tests, turning in historically impressive results. The company operates throughout the United States and has expanded internationally with its books sales, classroom and online courses. Visit our website at www.testmasters.com, follow us @testmasters, watch us on www.youtube.com/testmasters, read our blogs College Compass, It’s Not GREek, or The GMAT Project, or contact us at our office Monday through Friday 9:30–6:30, Saturday 9:30–2:30, Sundays closed.